Trader Joe's is gross. Something is off. The meat isn't fresh, for example. The produce? A joke. The microwave foods? Tasteless. I'd rather have Ralphs or Vons. Yeah, just like I don't understand the cult worship of Whole Foods...same goes for the Cult of Trader Joestown. My friends all say "oh but it's natural...!" then proceed to only buy the crap from the frozen section. (Their premade items have VERY high calorie counts as well) Some of their fresh produce is well priced, that's about all I can say for Trader Joes. Ranch 99, Nijiya, and H-mart are the best 'chain' markets in LA, imo. I went for the first time in years into the Whole Foods on San Vicente in Brentwood, in search of a good caprese. I found no caprese whatsoever. And it then ocurred to me that Whole Foods is just as phony as the people who shop there. Whole Foods is billed as being something of a willingly highfalutin establishment for rather discerning, well-informed consumers. No caprese? Are you kidding? Caprese is a fresh and healthy snack affording just enough savoriness to be consumed in its own right, but not so overwhelming as to not be an excellent choice to compliment a nice glass of one of the lighter reds, such as cabernet sauvignon (that's a type of wine, in case one of you domestic beer drinkers were wondering). Or, if you prefer, dip a bit in red vinegar. Olive oil on the side is fine as well. But no, Whole Foods did not have caprese. They did, however, have box after box of sushi. Really? Sushi? What decade is it? I thought sushi went out with The Pet Shop Boys and Miami Vice. What a sad little joke of a grocery market. Whole Foods? More like Whole Fools. Whole Foods is the sort of store people shop at who want to have high culture, but they actually do not and wouldn't know high culture if it landed on the hood of their Prius and said hello. So an epicurean is bemoaning the fact that there wasn't a pre-made caprese to be had? Wow, that has to be the easiest salad to make. 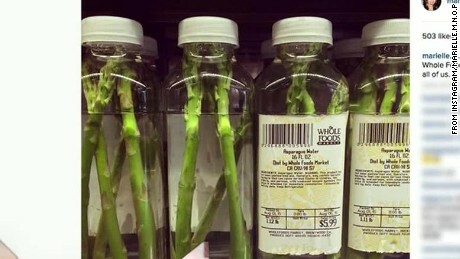 Anyway, if you simply can't make your own asparagus water they have you covered. I think with both stores people like the idea that anything they pickup is going to be 'healthy'. Their frozen stuff at TJ tastes better and is more interesting than the stuff you can get at Ralph's or Vons at least. Prices at Trader Joe's are a pretty good value on certain items and a lot of the items you can't even find at larger chains like Ralphs or Vons. They always seem to have new products to try too which helps in having people come back. "Oh this is new, i'm going to try it"
The one I get less than Whole Foods or Trader Joe's is Gelsons...which seems to have a lot of the same products and brands but higher prices. Even if I had a bunch of money I think just on principle I'd be pissed paying so much more for items just because it's being sold in "Gelsons"
I still love Sushi. I also like Caprese. And a HUGE fan of Phillip Michael Thomas. just a heads up from a Westsider, no one goes into that Whole Foods on San Vicente to "shop"... it's all about the people-watching and trying to spot stars & celebs out in the wild. I've seen Conan O'Brien in line as well as Fergie. The cashier girl has spotted Tom Hanks and Rita Wilson shopping, as well as Gwyneth Paltrow and Chris Martin (from Coldplay). There are also plenty of B-starlets from those chick-lit series churned out by Alloy that come in. Unless you're a certain female teenage demo you'd wouldn't even know who these actors were (my gf at the time was a casting agent so she some clue). btw, the Whole Foods on Wilshire & 22nd in SM has a bigger prepared food-to-go "deli" selection. Those poor people, lol! Never a moment's peace or anonymity. Do you ever have any fun? I'm pretty sure EAP's been having fun with this whole thread. Seems similar to Robertson Blvd...does anyone ever really go there to shop? Or just for the 'scene'?